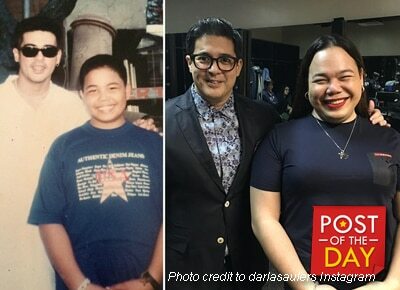 The talk show writer reveals his then and now photo with the former matinee idol. Talk show head writer and blogger Darla Sauler could not help but get star struck over Aga Muhlach, who just signed a contract again with ABS-CBN. Darla posted 2 photos on Instagram of him with the former matinee idol – the first one taken 22 years ago and the second one during Aga’s contract signing this afternoon, August 18. “22 years ang pagitan. Laking LIGAYA para sa isang AVID SHOWBIZ FAN na tulad ko. Hihihi. Tutal it's AGA MUHLACH DAY, todo ko na ang Throwback Thursday! Hehehe!” Darla said in her caption.